Yesterday I received my copy of Crypts & Things from Lulu.com. C&T is basically a variant of Swords & Wizardry (itself a clone of OD&D) which draws upon some sword & sorcery rules from Akratic Wizardry. One significant difference between C&T and S&W/OD&D is that it does away with the cleric class. Instead, there are only magicians, who can cast white, gray or black magic spells. As you probably guessed, the healing and protective cleric spells fall within white magic, manipulative spells fall into gray magic and destructive/entropic/’unnatural’ spells fall within black magic. Black magic requires a ‘sacrifice,’ either a sentient being or CON points equal to the spell’s level. Oh, and it has a chance of driving the magician insane. Clearly, black magic is not to be trifled with. A few other differences: hit points represent exhaustion, scratches and bruising and thus recover much faster, usually all with just a single night’s rest. Once your HP are reduced to 0, additional damage reduces your CON score, representing serious physical damage. CON damage takes a lot longer to heal. C&T also introduces sanity, based on your Wisdom score. Using black magic can reduce your sanity, but so can encountering demons and otherworldly/supernatural phenomena. If you lose all your sanity, the GM takes control of your character and additional sanity loss reduces your Wisdom score permanently. Ouch. Unlike S&W, C&T is set on a specific game world, the dying world of Zarth. A map for the Continent of Terror, one of many land masses on Zarth, is fleshed out (sparsely, in old school tradition) with important cities and locations. But nothing stops you from using a setting of your own design, or an established swords-and-sorcery setting, such as the Hyborian Age. 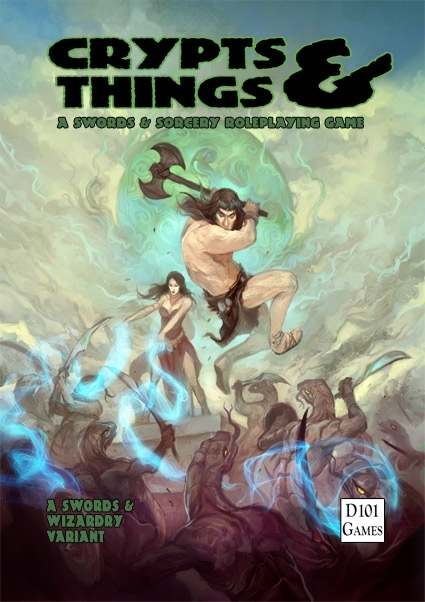 There are definitely some things in C&T I’d borrow if I ever get the chance to run an old school game using Swords & Wizardry, but I probably wouldn’t use the entire C&T rules en masse. I’d just pick and choose what I liked best (like the hit point and sanity rules, and maybe the white/gray/black spell system). You can pick it up at DriveThruRPG or Lulu.com if you’re interested. Cheers. This entry was posted on March 3, 2012 at 11:29 am and is filed under RPGs, Swords & Wizadry. You can follow any responses to this entry through the RSS 2.0 feed. You can leave a response, or trackback from your own site.